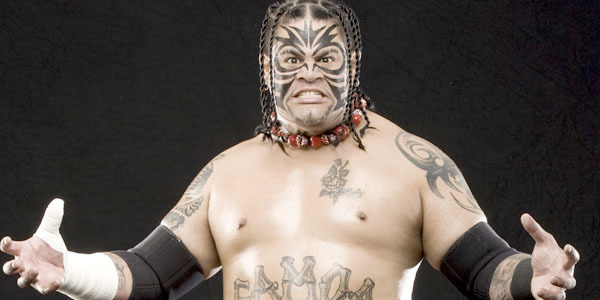 Edward 'Umaga' Fatu had a bit of a turbulent time in the WWE. During his first stint in the company, Fatu as 'Jamal' (wrestling as part of three-minute warning with Rosey) developed a reputation for being reckless in the ring. He injured several performers (including veteran Pat Patterson) and WWE weren't best pleased with his in-ring progress. As punishment, Jamal was booked to take a stinkface during the 2003 Royal Rumble, from his own brother. He was released following a fight at a nightclub and many figured that was the end for him and the WWE. But Fatu went to All Japan Pro Wrestling and began rebuilding his reputation, becoming a much more well-rounded performer. WWE signed him again and he debuted as the Samoan savage, Umaga, in late 2005. It would be the most successful period of Fatu's life, a period that saw him have sterling matches with John Cena and Jeff Hardy and playing a part in the incredibly entertaining 'Battle of the Billionaires' at WrestleMania 23. Fatu was released on June 8th, 2009 after refusing to attend rehab following a second wellness policy violation. After a brief run on the independent scene, he died on December 4th after suffering two heart attacks. He was 36 years old. WWE has in the past tried to distance itself from performers who have had issues with or died via their drug abuse. Umaga is very rarely, if ever, mentioned by the company. It doesn't want to be associated with a man who died in his mid-30s due to drugs. They will be hoping now that Rikishi is back in the spotlight, that reporters don't start asking those 'awkward' questions again. Expect RIkishi to pay tribute to Umaga ('Eki' to his friends and family) during his speech.